The FlyMarker® mini is already the fourth generation of the proven, battery operated dot peen marker. The long-term experience in manufacturing mobile hand-held marking systems and the comprehensive knowledge about the customer and market requirements have been consistently integrated in the development of this product. The compact marking device convinces next to a high-quality construction, its low weight of only 2.7 kg, a self-explanatory software and a stable two-hand operation also with its attractive price. The housing consists of glass fibre reinforced plastic and is with this more break resistant than for example housings from die-cast aluminum. The control unit, a high-resolution LC display as well as the keyboard are integrated in the housing. The marking area has a size of 65 x 30 mm. Nearly all materials can be marked durable and unforgeable – from plastics, aluminum and stainless steel up to hardened steel. Depending on the material and the customer requirements, the marking force and with this the marking depth can be adjusted individually. Subsequent processing such as sand blasting, coating, and so on mean not a problem in most cases. The marking remains visible. Next to characters and numbers also individual company logos, test symbols or Data Matrix Codes can be marked. Battery operated - 100% mobile. The powerful Lithium-Ion-Battery enables a completely mobile work with the FlyMarker® mini. Tripping hazards due to power cables or cables for compressed air supply as well as accidents at work due to common stamping tools belong to the past. Due to it’s low weight, this mobile marking unit can easily be carried through the works premises directly to the big and unmovable work pieces to be marked - just like it happens day by day with a common cordless screwdriver. For the transportation to another construction site or a different hall, the practical carrying case can be used. Due to the well-conceived economics, the marking device sitsperfectly in the hand and an effortless operation is possible, also in vertical work positions. An additional handle is mounted on the front face of the marking system. This handle allows an ergonomic two-hand operation and an even easier, precise and secure positioning of the marking system on the work piece to be marked. Slipping away during the marking process can be avoided. If there is less space between work pieces, the second handle at the front face of the system can be dismounted easily. The programming of the marking files can be done directly via the integrated keyboard. This keyboard is oriented to the field of view when the marking unit is positioned vertically. This enables a very easy data input. Compared to a membrane keyboard the data input is much easier as proper key buttons are available which are clearly defined and very easy to press. Due to the numeric keys which are directly integrated in the keyboard, numbers can be typed in directly without accessing a submenu of the software. 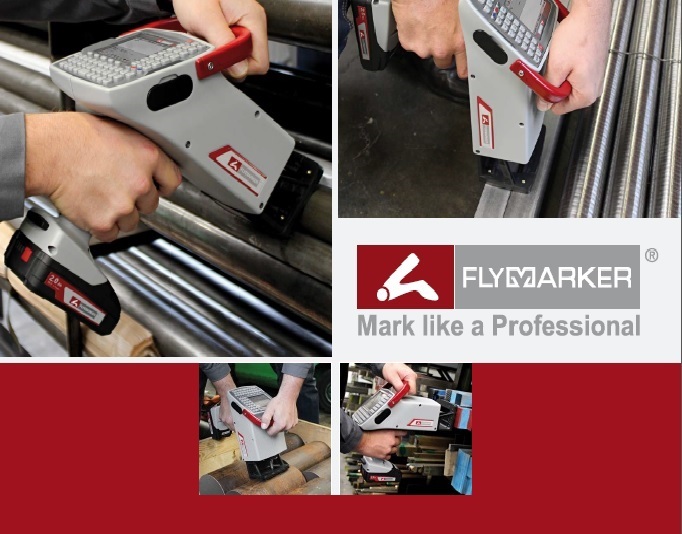 The FlyMarker® mini owes its good marking results to the stable and long-lasting mechanics. The high-quality linear guides in x- and ydirection are double guided. Compared to systems with a swinging axle, it is with this dot peen marking unit possible to create very precise multi line markings without any loss in quality of the marking result. Due to a continuous, solid and robust base support with an integrated positioning plate, a high mechanical stiffness can be guaranteed. The marking force of the solenoid can be adjusted individually to the material to be marked and to the needed marking depth. The electronics of the FlyMarker® mini is well protected against soiling. All electronical cables are led in a trailing chain. The built-in interfaces are covered and with this protected from external influences. The clearly designed software of the FlyMarker® mini is very easy to understand and can be operated intuitively. Only small computer knowledge is necessary. Thanks to the use of latest processor technologies, a fast navigation and quick access times to the marking files is possible. There are many language versions available. Helpful commands such as variables for time, date or auto numbering are included in the standard scope of delivery. Via the practical preview function it is possible to picture the marking file in the LC color display before the marking process will be started. With this incorrect markings can be avoided. Several hundreds of marking files, fonts and logos can be stored and administered in the internal memory of the handheld marking system. 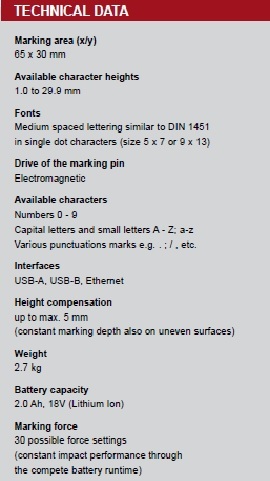 The USB-interfaces positioned on both sides of the FlyMarker® mini enable a fast import and export of marking files. Also external devices such as for example a barcode scanner can be connected to these interfaces. 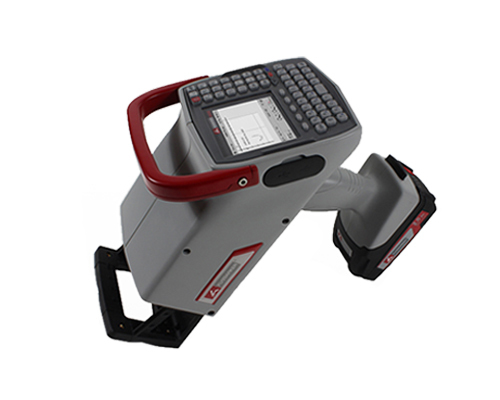 The content of a barcode can with this be read very quickly into the system and the characters and numbers can be marked directly on the work pieces using the preset configuration. 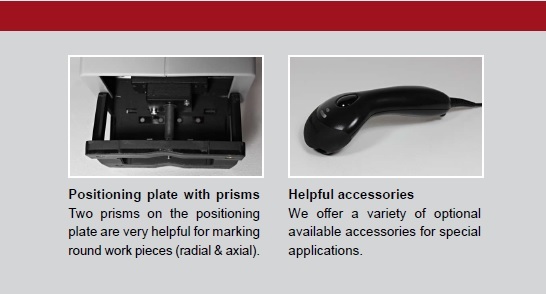 Two prisms on the positioning plate of the FlyMarker® mini help to mark round work pieces very easily (radial and axial). Height differences up to 5 mm can be compensated. With this also uneven work pieces can be marked in a constant marking depth.